Nuclear powered lighter-aboard ship The "Sevmorput" nuclear powered lighter-aboard container carrier is the only icebreaking nuclear powered freight ship in Russia. It was built at Kerch ship building plant in period from June 1, 1982 to Dec. 31, 1988. The project of the vessel was designed based on joint decision of the Ministry of Marine Fleet and Ministry of Ship Building N C-13/01360 dated May 30, 1978, according to the specifications. The body of the vessel was designed and built with the ice reinforcement "ULA" category according to the requirements of the Register Rules of the USSR, 1981. 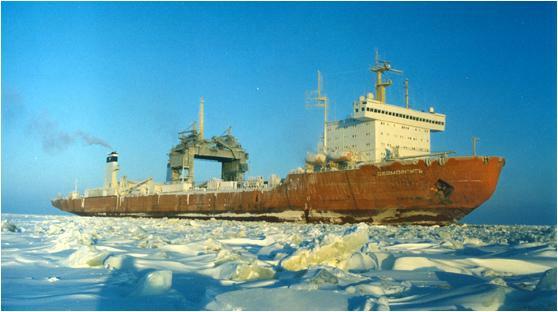 The "Sevmorput" nuclear powered icebreaker was commissioned on Dec. 31, 1988. Since the ensign was raised and the operation started, the "Sevmorput" has made 302,000 miles, carried more than 1.5 million tons of cargo with the nuclear reactor has been recharged only once. For comparison, the SA-15 type vessels operating on the route in Dudinka would have to make almost 100 voyages to carry the same amount of cargo, with almost 100,000 tons of fuel to be spent. * LASH type lighters in the specially provided cells in the bilge and on the main deck, loaded and unloaded by ship lighter cranes. * International ISO standard containers in the bilge and on the main deck without special rearrangement of the ship; load/unload is carried out by coastal means. Limited lots can be loaded and unloaded with container add-ons of the lighter crane. Total number of lighters to be taken aboard: 74 of 300 tons each or 1,328 of 20ft containers. Hatch covers durability allows transportation of loaded 450 tons lighters, stacked in two levels by height, or 20 and 40ft international standard containers in three levels, with maximal weight of each 20.3 and 30.5 tons respectively. The "Sevmorput" is capable to break ice up to 1 m thick. Class: single-screw, one-deck nuclear powered icebreaker with redundant freeboard, foredeck, bow arrangement of dwelling superstructure, intermediate arrangement of engine-room and reactor block, with slanted icebreaker stem, cruiser stem cut in surface part in the form of transom. The vessel is capable to run in solid ice up to 1 m thick with the speed of about two knots. The body is divided by 11 transverse watertight partitions into 12 compartments including 6 cargo bilges.